Chaired by Agrovista Senior Agronomist Paul Bennett who welcomed a 'full house' of growers to the 2018 Agrovista Technical Conference. Agenda items: With nine presentations, The English Apple Man will look at three which may be of interest to a broad spectrum of my readers. Jack Harris explored the technology being used to deliver soil and nutritional profiles. Traditional soil evaluation woud revolve around digging a large hole to observe the type of topsoil and subsoil....taking a number of soil samples using a hand held 'corer' - then sending each for pH and NPK analysis has been the process for many a year. Probably the most accurate soil profiles were initiated by Basil Furneaux back in the 1950's where a full farm soil profile was created allowing more accurate growing and nutrition practices. Very good; but of course, time consuming and expnensive! The new techniques offered by Agrovista's Plantsystems technology offer faster profiling and more accurate data. The ability to profile soil type, organic matter and nutrients can be further enhanced by aerial mapping using drones. Matching cropping records against soil profiles enables a better understanding of soil/crop correlation. Below: In todays market, the size and quality parameters are critical if growers are to be profitable. Eating quality is paramount, but visual quality is equally important. Red colour catches the eye and 50% 'block' red colour on Gala is the target, with 70-80% of the surface coloured red. But the yield and quality drivers can not be achieved without maximising cost reduction initiatives. Thinning to achieve the right size and quality is an expensive process, whether by hand thinning (very expensive) or by mechanical or spray thinners. 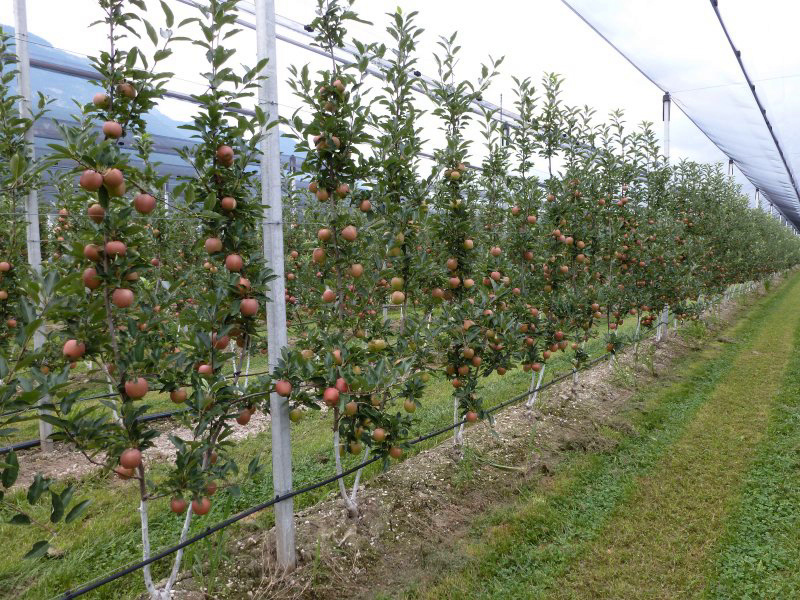 The target yields require a bit more than efficient thinning; to maximise financial returns, 'hanging the crop' on the most effective tree shape is paramount. Trees must be capable of maximum light interception; a narrow tree format is the ideal tree shape and John Portass is utilising Bibaum (twin leader) trees as his ideal format. mix right is just part the equation; soil preparation and wildflower management are critical if the investment is to be successful.